After being thoroughly impressed with my meal at Ming Tsai’s Blue Ginger in Wellesley, I’ve been dying to get to his Boston based restaurant Blue Dragon. 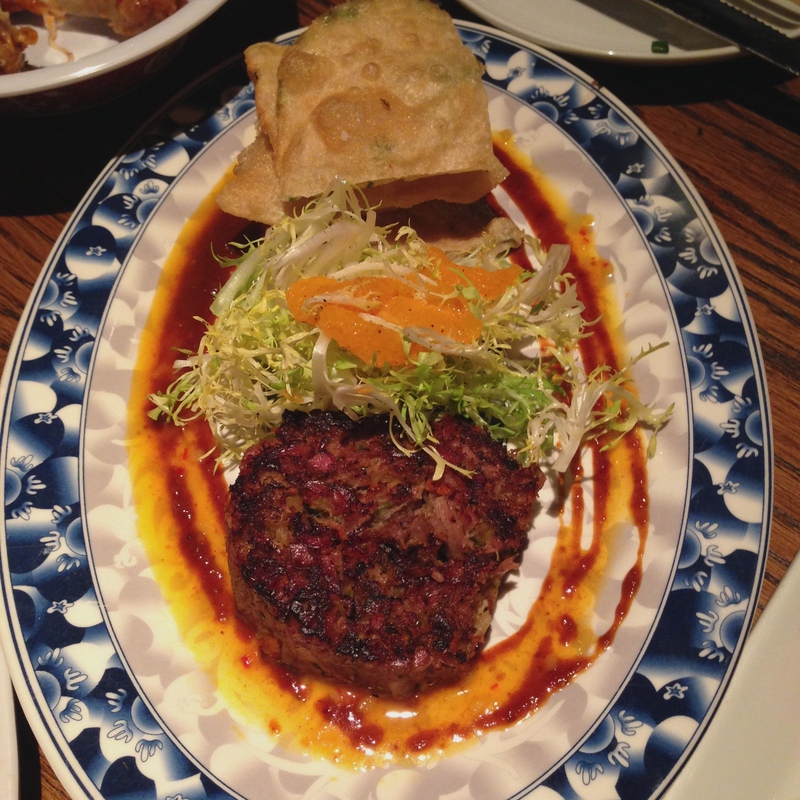 While both of Chef Tsai’s locations boast East-West tapas style menus, I found Blue Ginger to be more of a casual yet sophisticated environment, and Blue Dragon had more of a comfortable neighborhood -joint atmosphere. I personally preferred Dragon’s decor, covered in wood and warm earth tones. We also dined early on a snowy Saturday night, which added to the cozy feel. Matt and I were joined by our two friends for dinner, and we did the tapas menu right! We ordered from just about all 7 menu sections (Snacks, Dim Sum, Veggies, Plates, Rice + Noodles, Platters, Dessert), and were pleasantly stuffed at the end of the meal. Let’s start with a mocktail, shall we? 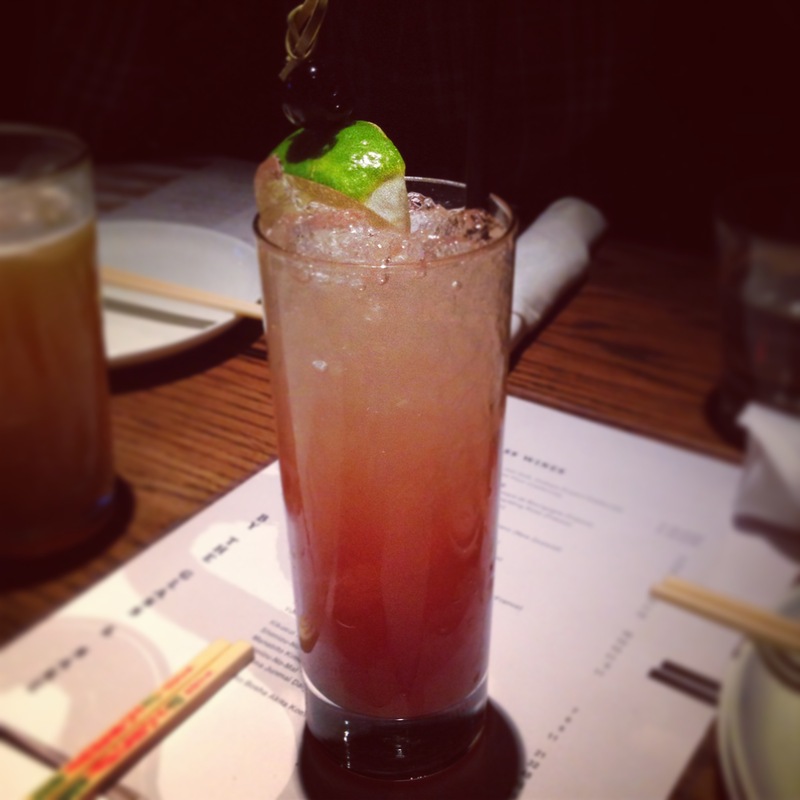 This one is a take on their Hurricane cocktail, which typically comes with Mt. Gay Black Barrel, passion fruit, bitters, and citrus. Mine was perfectly delicious without the alcohol. Grilled vegetables with a flavorful dipping sauce? I don’t really care what it is, I’m in. 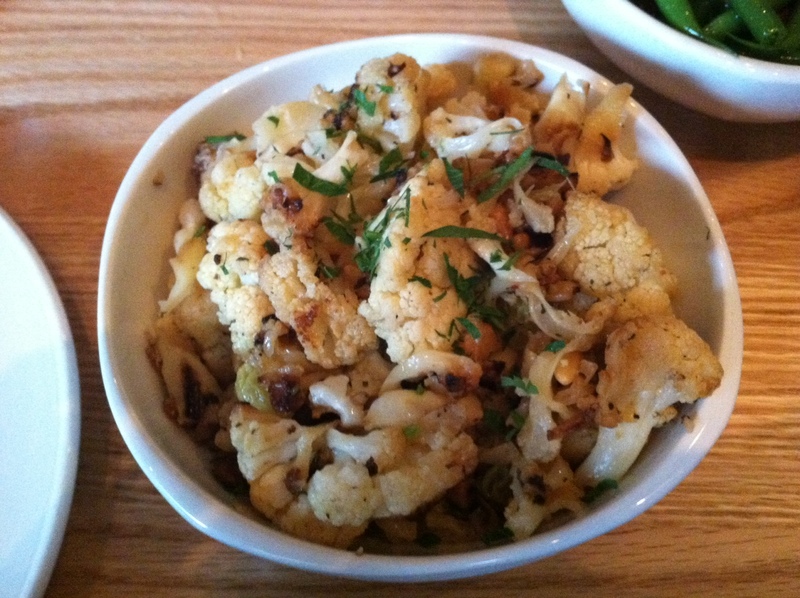 This wasn’t my favorite dish – mainly because we tried incredible plates, and how mind-blowing can cauliflower really be? – BUT it was good and a nice start to the marathon meal. 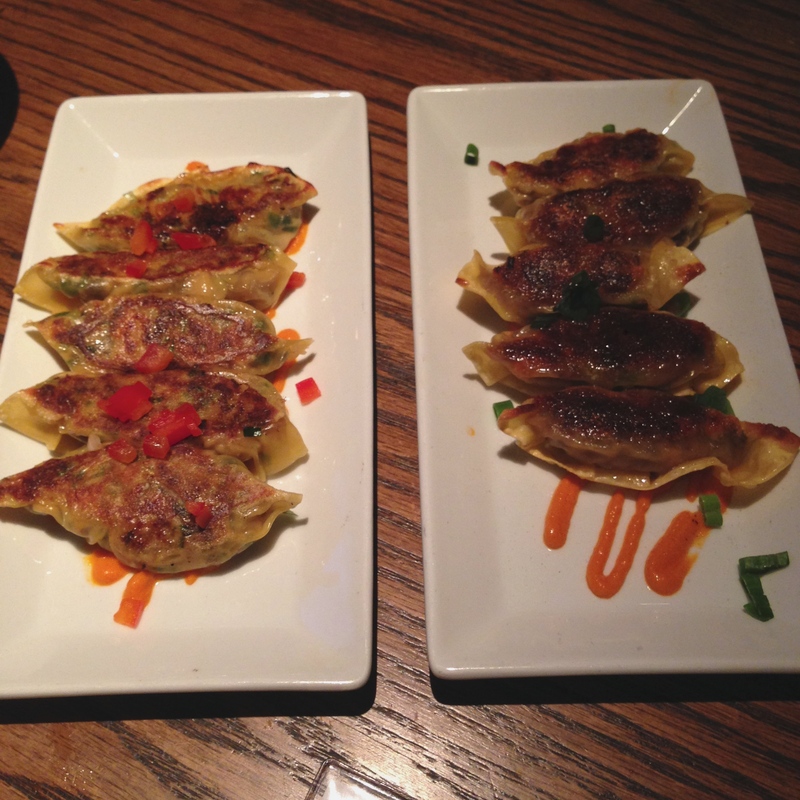 These wontons were stuffed full of slightly spicy pork and still managed to be light. Granted I only had 1.5 pieces, but I could have easily had all 6 to myself. I’ll eat some mushrooms in some dishes, but they still aren’t a favorite of mine. I definitely preferred the short rib version of this appetizer. Mmm, shepherd’s pie. What a lovely surprise to see that it was topped with both white and sweet potatoes! Covering the ground curried lamb, the potatoes were whipped and smooth. 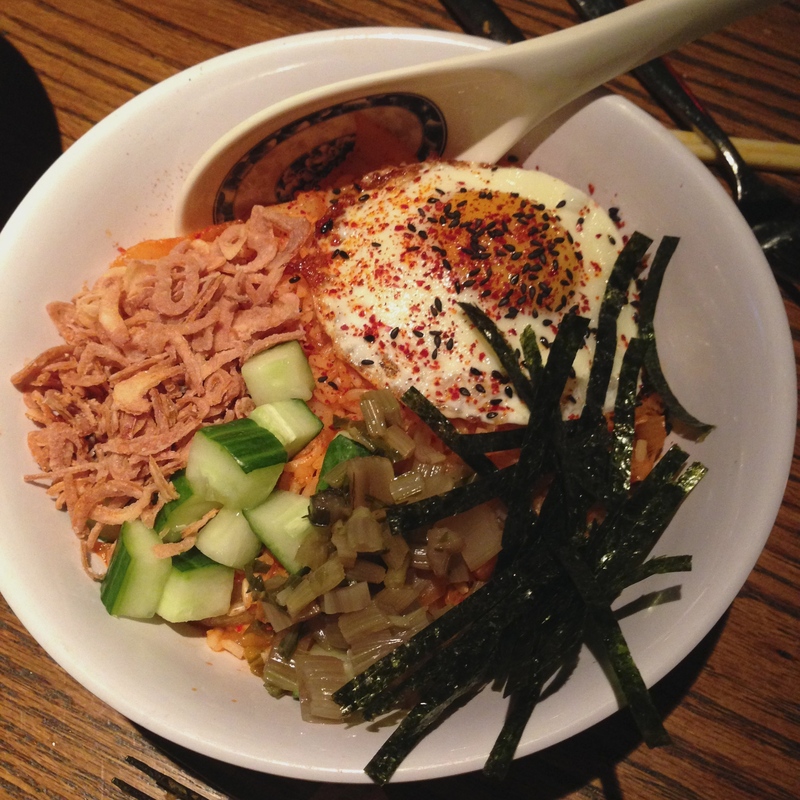 Comfort food at its best. Now I know what you’re thinking, because we were thinking it too: a) what the hell did we order, b) something dirty. 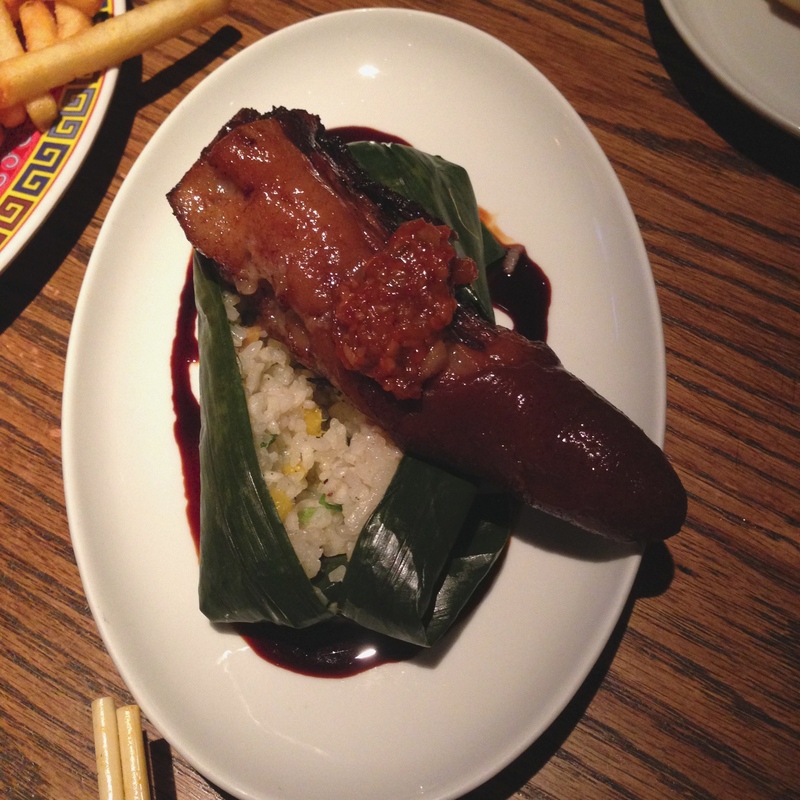 Luckily the waiter came by and told us what to do with this… thing. It comes on a soft bone and we were instructed to shred the meat off the bone, mix it around with the sauce on top, and eat it with the rice. Once we did that it looked more like edible meat and was actually quite tasty. The pork tail has a lot of flavorful fat so you really have to shred, mix, and combine all components well. I’m a sucker for burgers, and who doesn’t love a mini-burger? These little guys were stacked with flavor, a favorite of mine for sure. 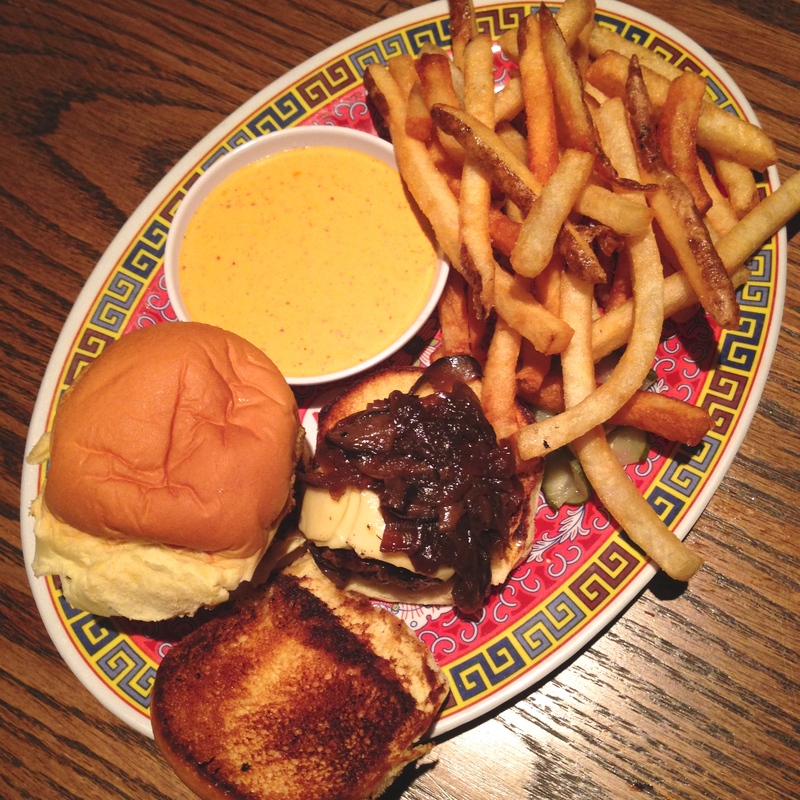 We weren’t sure what the sauce was exactly, but it was amazing, tasted great on the burger and as a fry dip. We cleared the plate then kept the remaining sauce to put on whatever we could. 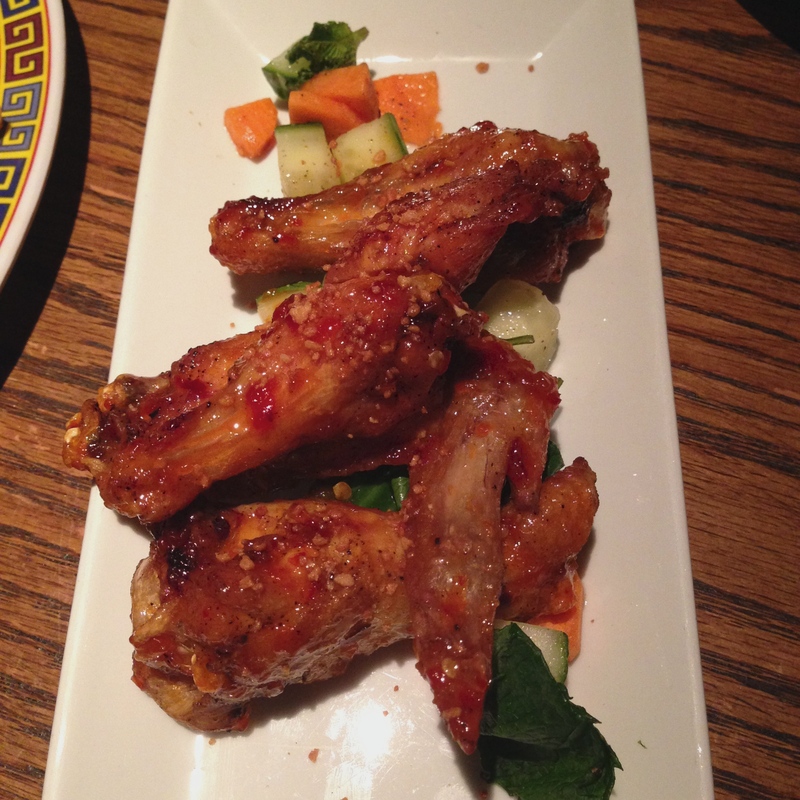 Chicken wings aren’t my thing, so I didn’t try these, but the general consensus was that they were worth the order. 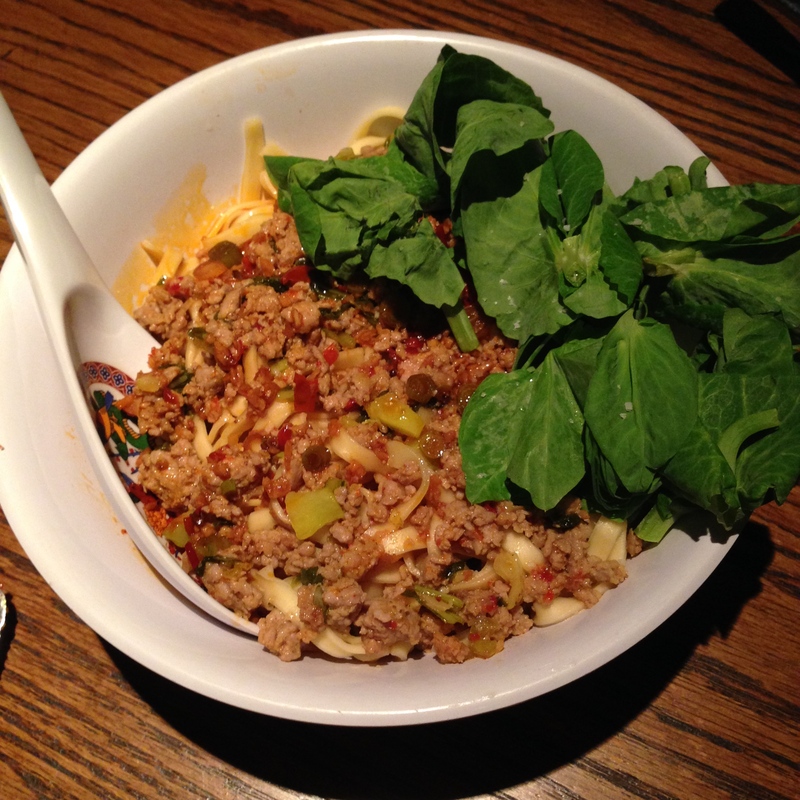 I was craving noodles, and to mix it with ground lamb? It’s a Asian bolognese! This dish had a nice kick to it all well. Definitely one of the top 2 dishes of the night for me. 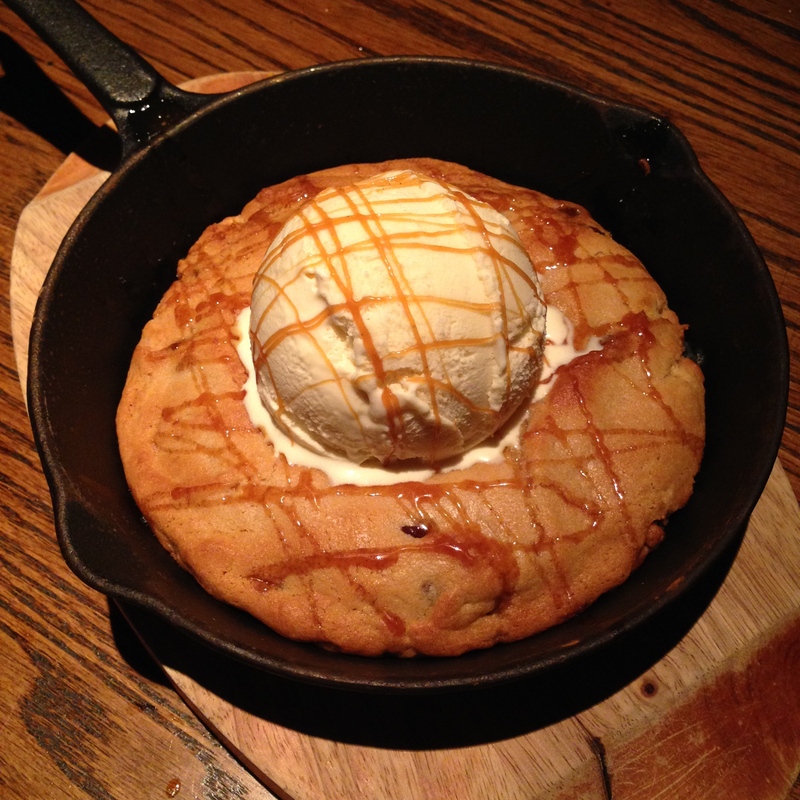 The largest chocolate chip cookie I’ve ever seen was served warm in a hot skillet, topped with vanilla ice cream and a soy caramel sauce. Parts of the cookie center weren’t fully baked, leaving a cookie dough consistency which I think was part of the point. Chocolate chip cookies aren’t on the top of my cookie list, and I typically say vanilla ice cream is a waste of time… but this dessert is a must try! 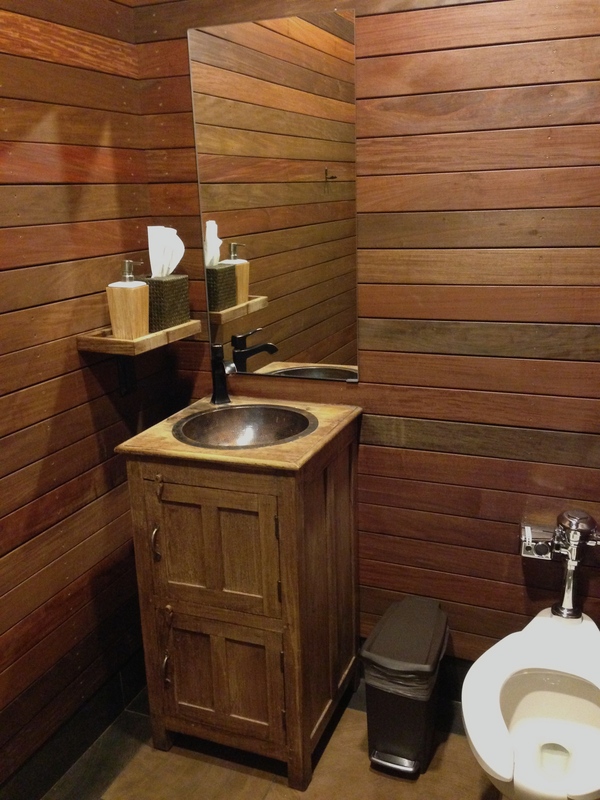 The bathrooms were awesome and kept with the “lodge-y” theme and feel of the restaurant. There are 3 private bathrooms (men, women, unisex) which I love. The unisex one has a 1-way mirror over the sink that looks into the kitchen! 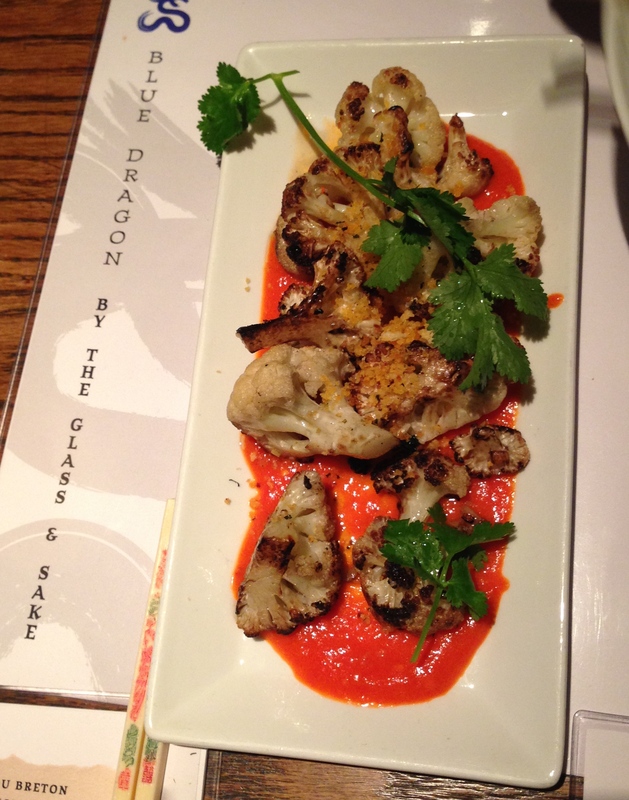 I don’t repeat restaurants often but I hope to go back to Blue Dragon sometime this winter. 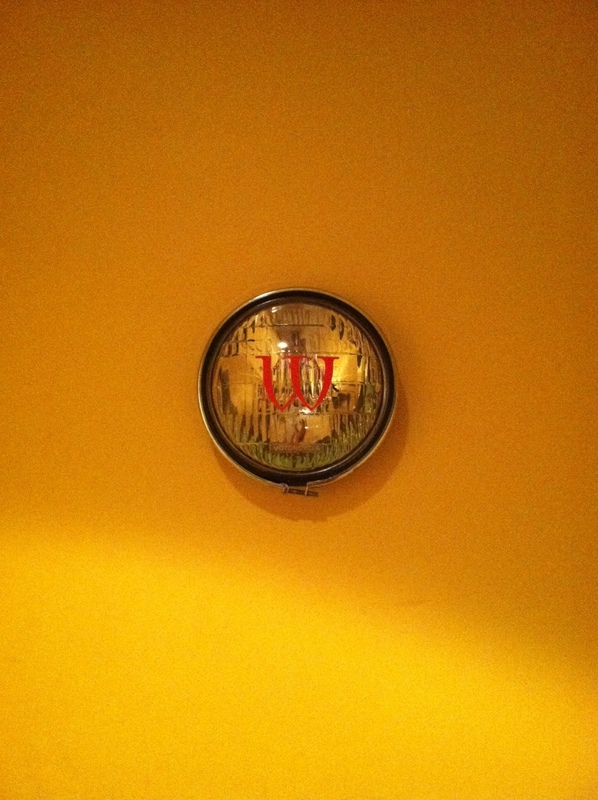 If not for the incredible food, then for the great cozy atmosphere and friendly wait staff. It’s a bit off the beaten path in the Fort Point area, not directly surrounded by much activity. Perfect for a cold winter night. I hear it’s typically quite crowded, and they don’t take reservations so you may have to wait for a table. But trust me, it will be worth it. 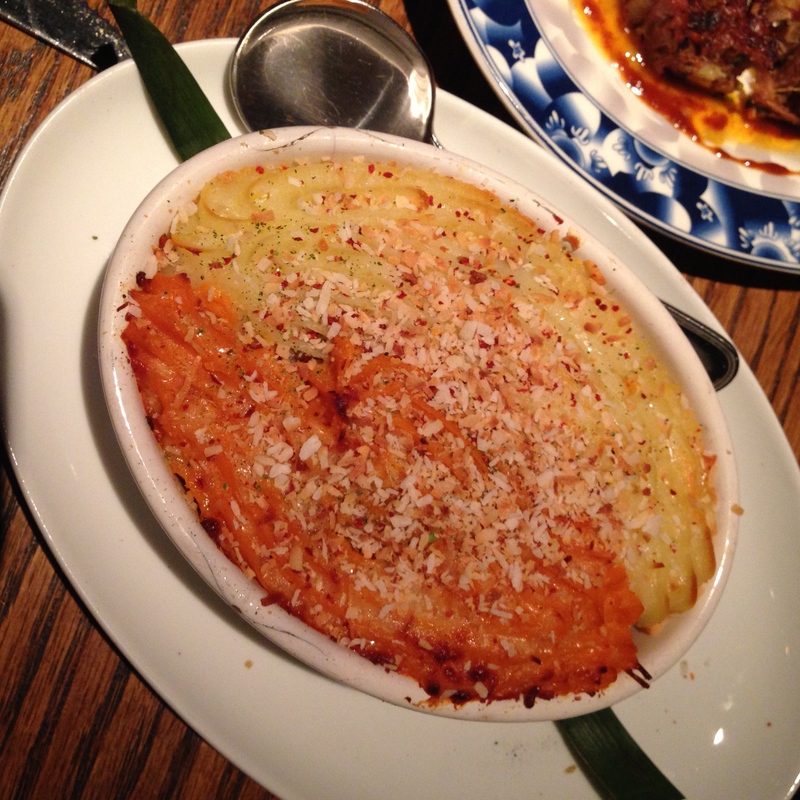 The Perfect Bite: Between the Dan Dan Lamb Noodles and the Lamb Shepherd’s Pie. 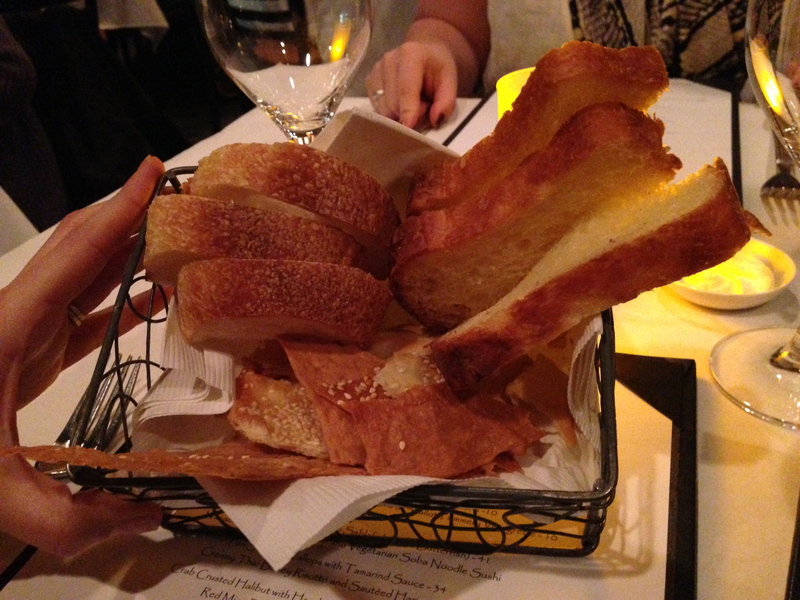 Bread: Three varieties of bread came with a small side of butter. The flat cracker sesame bread and potato-like bread didn’t need any butter as they had their own unique flavor, but I did spread a little on the slice of plain white. Menu: The structure of the menu is simple, offering Appetizers and Entrees. There’s also a note at the bottom of the page about the Chef’s Tasting Menu, but I didn’t inquire as I had a hard enough time with the options in front of me. The prices are definitely steeper than I’m used to but I knew this going into dinner, as Chef Ming Tsai is one of the best in MA, is nationally known, and has appeared on The Food Network numerous times. This is the kind of meal you don’t mind paying $40+ for because you know you won’t be disappointed, and it will probably be one of the best versions of whatever it is you’re ordering. That being said, I was torn between 3 dishes and opted for one of the signature dishes which has been on the menu for over 10 years. I wasn’t sure what to expect with this appetizer, but our server did a great job of describing how it was prepared. 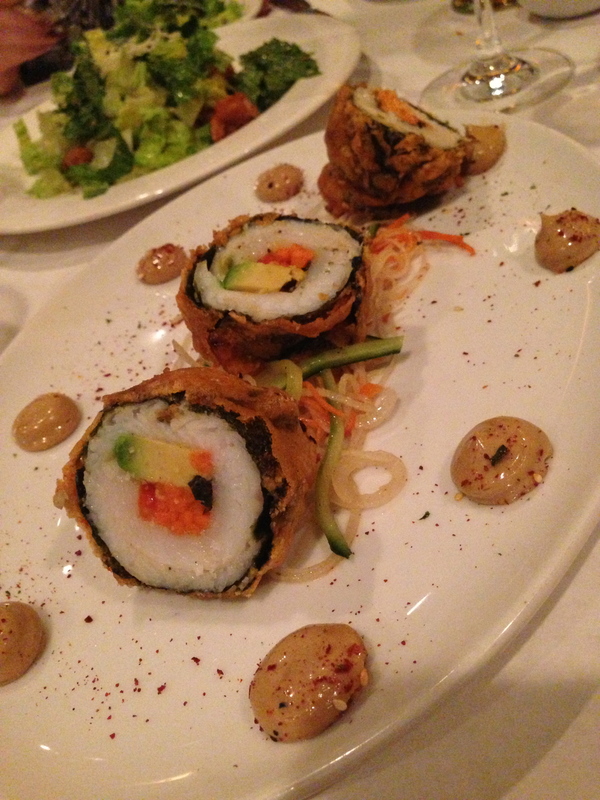 Three sushi roll-like pieces topped the vegetables and were surrounded by small dollops of black garlic aioli. The typical “rice” section of this roll was actually the sole which encompassed the avocado and carrots. The outside may have been deep fried but it didn’t make the dish heavy or greasy. Definitely a great way to start the meal! For my entree I was deciding between this and the other signature dish which a friend recommended, the Sake-Miso Marinated Sablefish (a.k.a. Butterfish). I think either choice would have been a good one, but I’m really glad I chose the lobster. 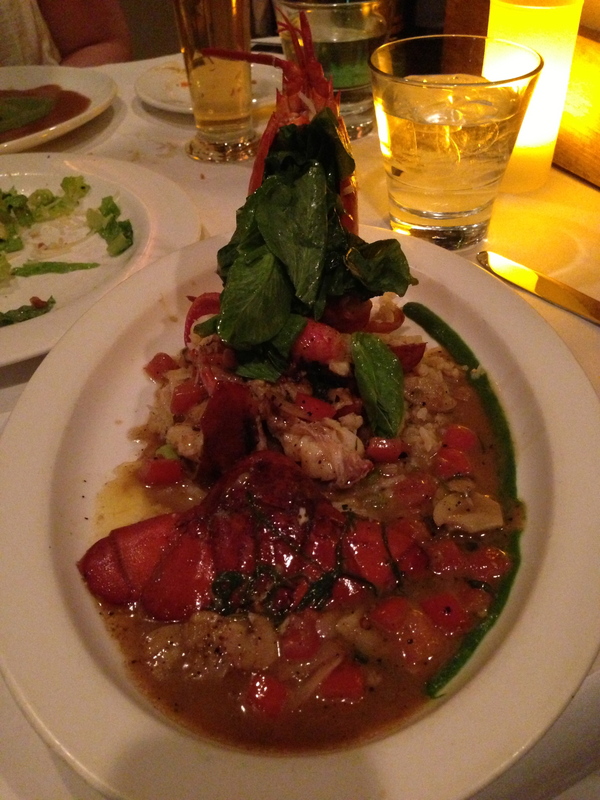 The shell of the body was stuffed with spinach and rice, and the plate was covered with big pieces of lobster tail, more rice, a few mushrooms, tomatoes, and incredible flavor! 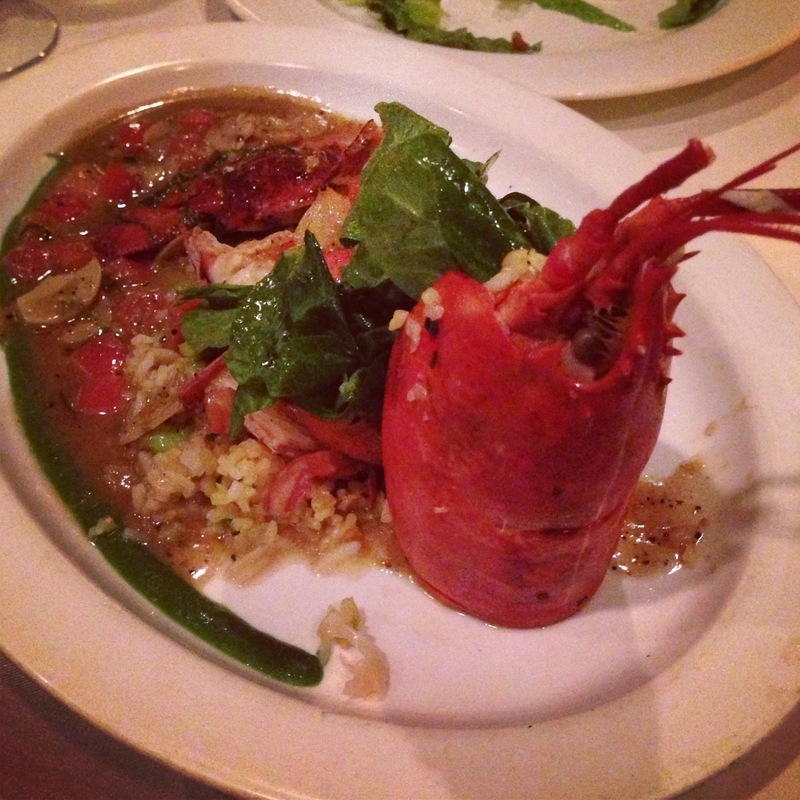 A fantastic lobster dish without the typical mess and work that comes with de-shelling. The dessert menu looked to good to pass up, so my cousin & I split this take on PB&J (one of my favorite combinations). The chocolate sorbet had a strong flavor, the jelly was amazing, and the peanut butter component had a smooth mousse consistency. Great way to end the meal! 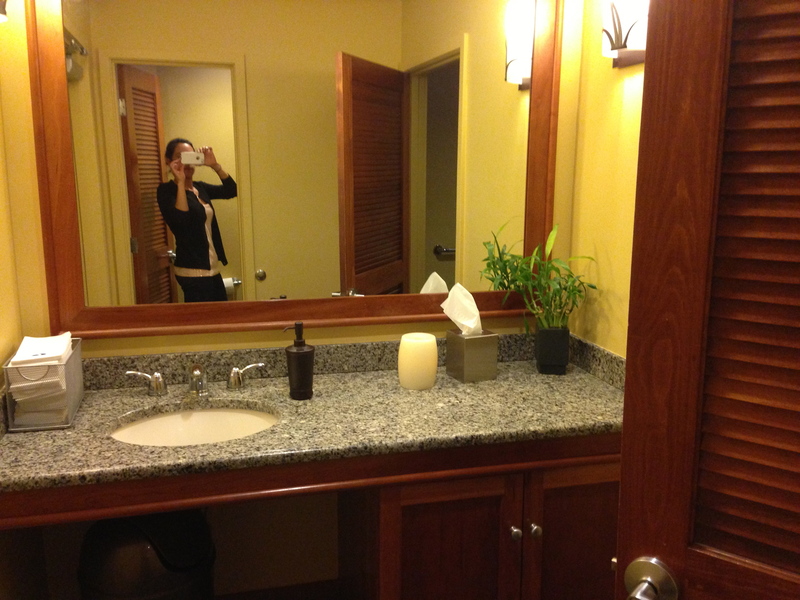 Restroom: The women’s room has 2 private stalls with wooden shutter doors (my favorite), a nice granite countertop, and warm and comfortable hues. I wouldn’t mind basing my home bathroom off of this design! Service: Our server was well informed and shared with us the signature and popular dishes as we had never been to Blue Ginger before. When deciding on appetizers he made a helpful suggestion; we were thinking of ordering the Tempura Sole-Avocado Roulade and the Shiitake-Leek Springrolls but he pointed out that they were somewhat of a similar appetizer, so we went with the Caesar instead. We were taking our time with the first course and he was great about not rushing us. When our entrees were ready and we still had some salad left on the plate he asked if we wanted to delay the second course until we were done with the first. We said it was fine to bring the entrees over, but it was nice of him to ask and make sure we were ready! Overall: Blue Ginger is Ming Tsai’s first restaurant, opening in 1998 and serving East meets West cuisine. A recent 2008 renovation added private dining rooms as well as a modern lounge featuring an Asian style tapas menu. The casual and chic dining room is set up with free standing tables and banquettes. Based on the high prices I thought the dining area would be a bit stuffy but I was happy to see it was more of a comfortable atmosphere. 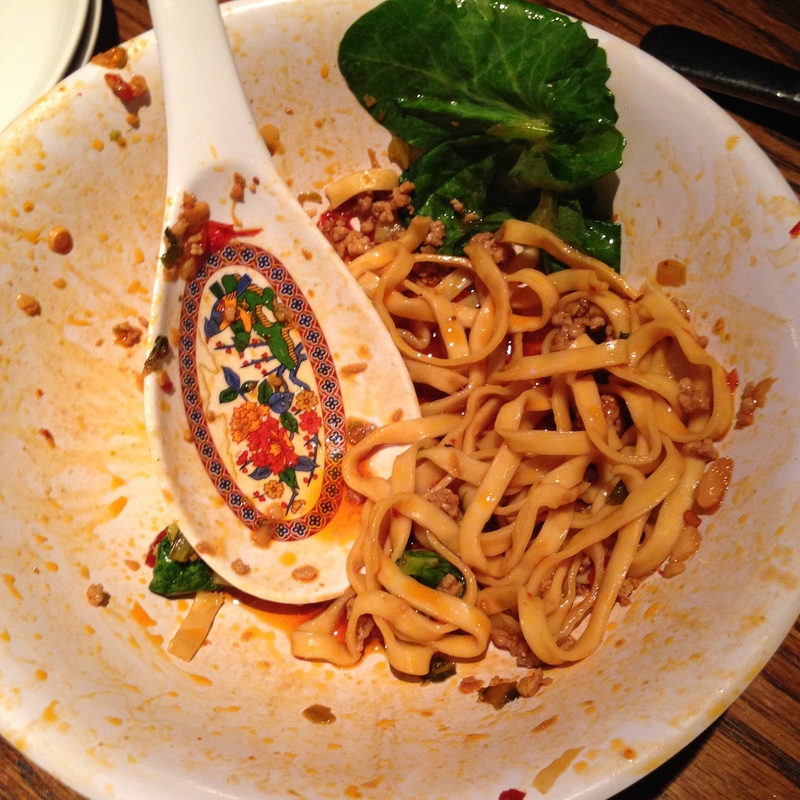 The service was great and the food was really excellent, just be prepared to spend! Appetizers run from $10-$17 and entrees range from $22 for a tofu dish to $41 for lobster or the signature sabelfish, most plates being $30+. Blue Ginger has an impressive beer, wine, and cocktail menu as well. 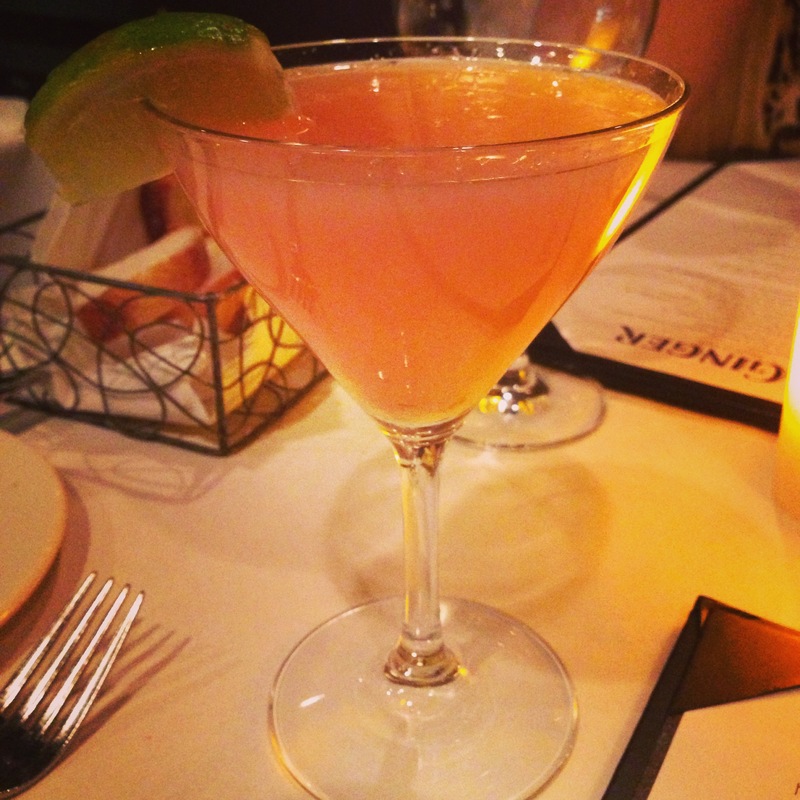 I went with the Polly-Tini: Ketel One, lychee puree, and pink grapefruit. 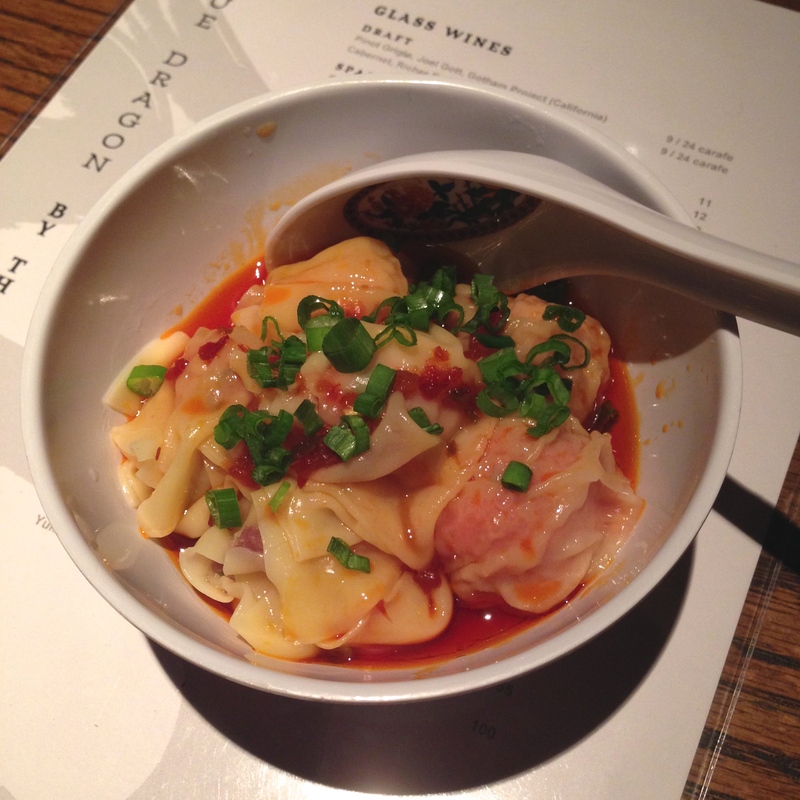 The menu of course has Asian influences but offers standard items like scallops, halibut, beef, lamb etc. 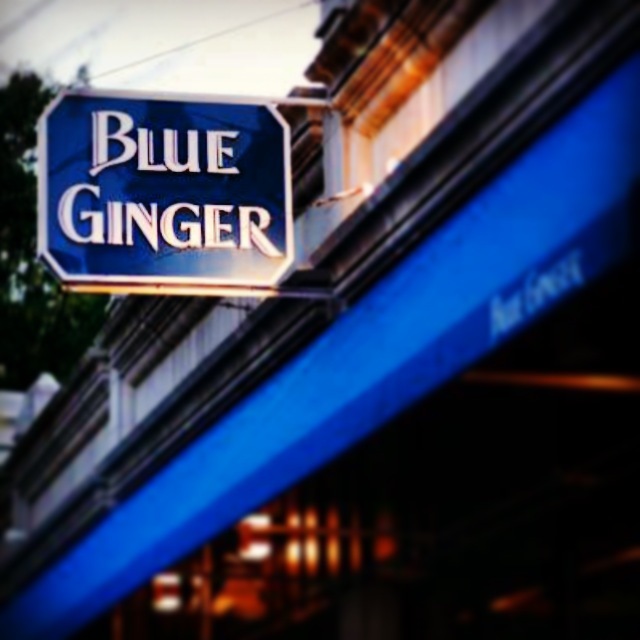 I highly recommend whether you’re in the Wellesley area or not, Blue Ginger is a must try. The Perfect Bite: Lobster, fried rice, and all the goodies! 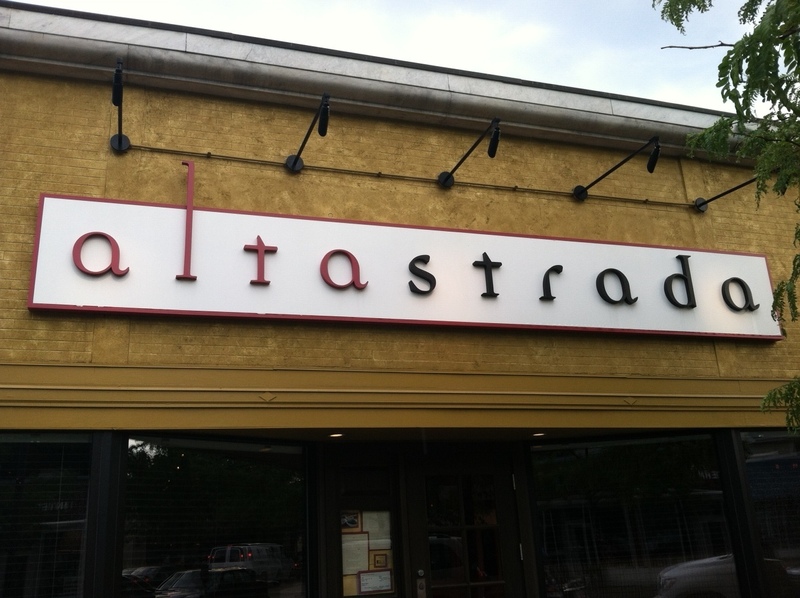 The last stop on my Chef Schlow list is Alta Strada in Wellesley MA. 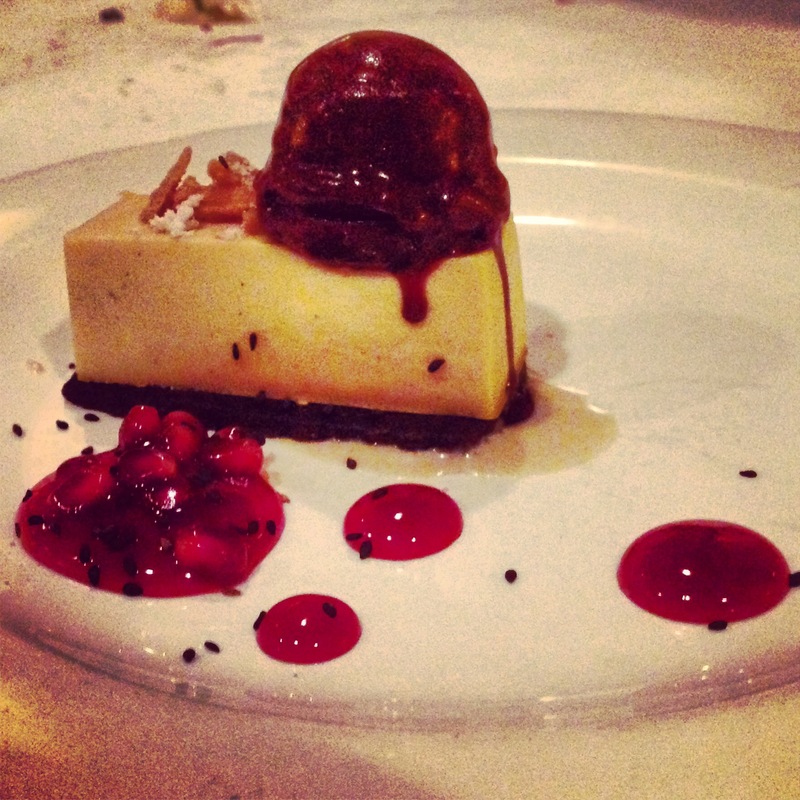 I tried Radius for Restaurant Week a few years ago, Via Matta is one of my favorite (expensive) Italian spots, Tico is perfect for cocktails & small plates, and my recent trip to Happy’s wasn’t bad (although I think it needs work). Out of all of Schlow’s concepts I think Alta Strada fits me perfectly. 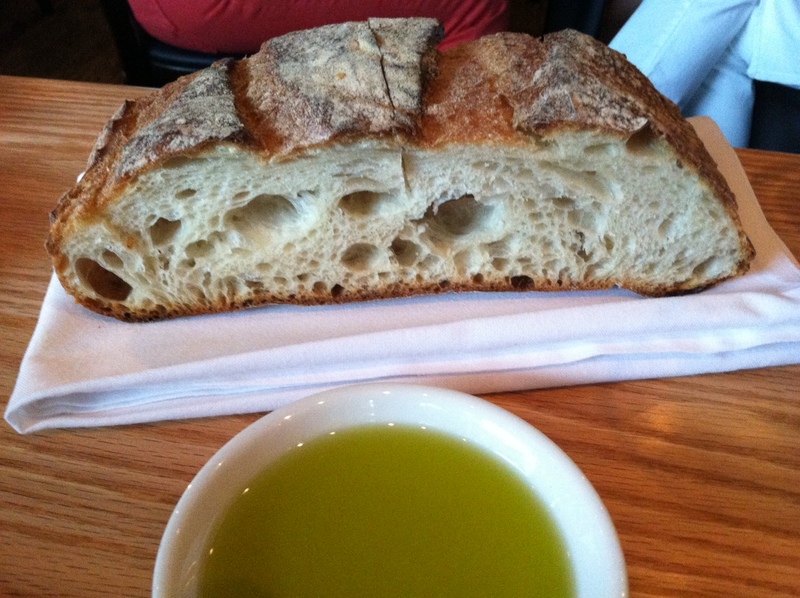 Bread: A think slice of bread that could have served at least four people was brought to our table as EVOO was poured into a shallow dish. It tasted fresh and I would have eaten the entire piece but we had quite a bit of food on the table already. Our Antipasti were served first and we were then asked if we wanted bread, which I thought was smart b/c not everyone wants that much food. Menu: The Antipasti Table (where you can select 1 for $6, 3 for $15, or 5 for $24 – all served at room temperature) Primi, Salads, Pizza, Pasta, Secondi. I was having a hard time deciding; I wanted to try some Antipasti, but a few of the Primi selections looked amazing (Lobster & Watermelon with English Cucumber, Basil & Citrus), and the fact that they offered ½ portions of pasta didn’t help! Not to mention the Famous Chopped Salad with Matteo’s Secret Dressing also sounded excellent. A generous portion of ricotta was topped with red pepper flakes, black pepper & EVOO and served with 2 oil-brushed and toasted crostini. After the crostini was gone I spread the ricotta on the fresh bread which was even better! 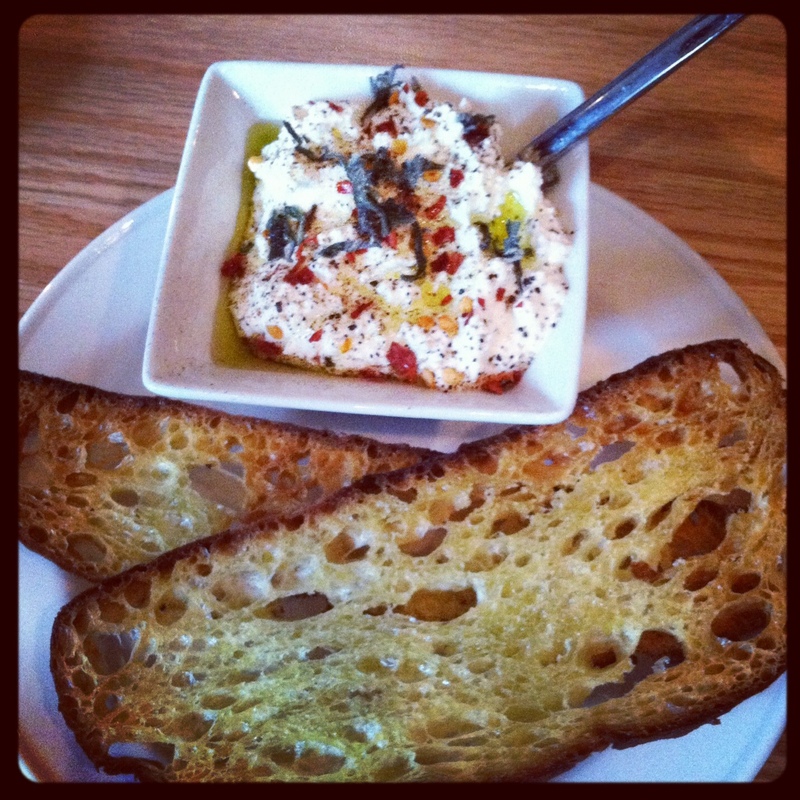 Really can’t go wrong with ricotta. 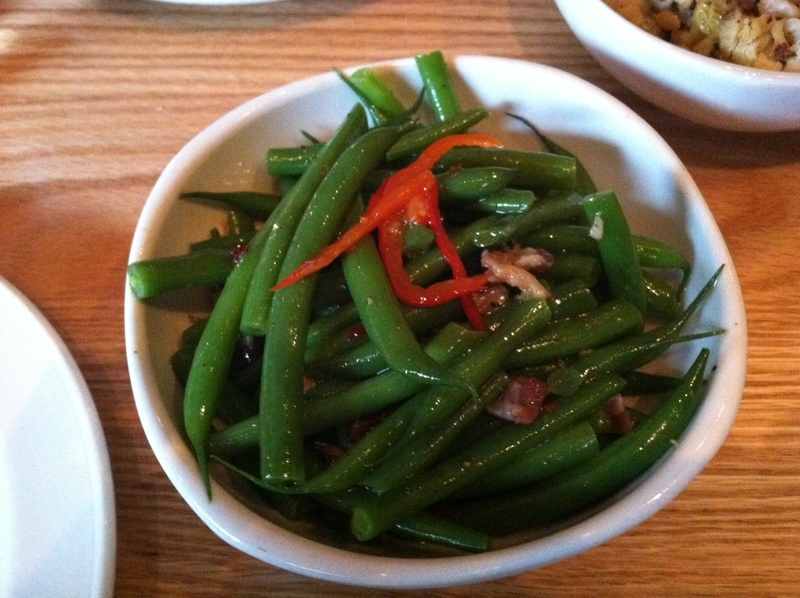 I only had a few bites but these were as good as green beans can be. Nice and crispy, and plenty of small bits of prosciutto at the bottom. It was between this ½ portion and the Famous Chopped Salad with its not-so-secret dressing of lemon and cayenne pepper, but I’m really glad I chose this dish. Chitarra pasta is typically cut with guitar-like chords creating long stringy pasta which held this thin spicy sauce well. This dish had a bit of a kick but wasn’t too spicy (perfect for me), and there were a few pieces each of the lobster and shrimp. Bathroom: Both the men’s and women’s restroom were labeled with an “M” and “W” on a motorcycle headlight. 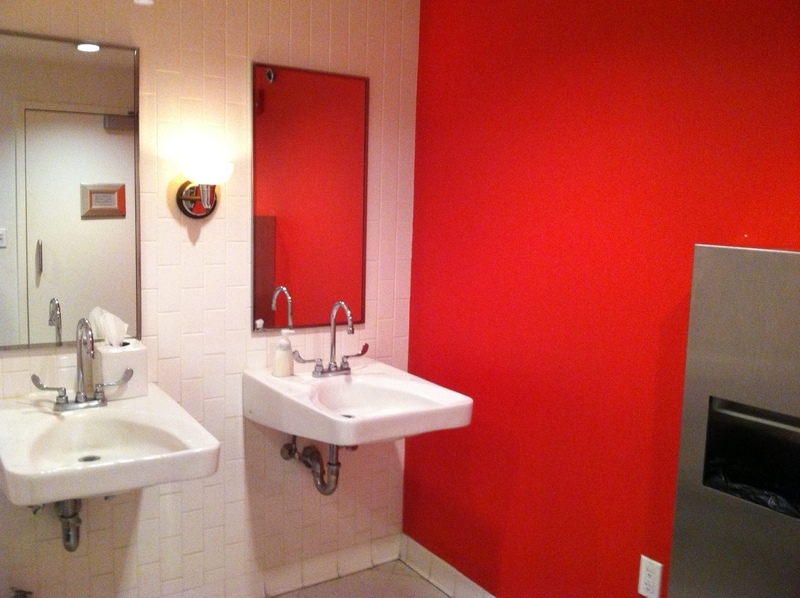 I expected the inside to have more character but it was pretty plain with 2 stalls and one bold red wall. 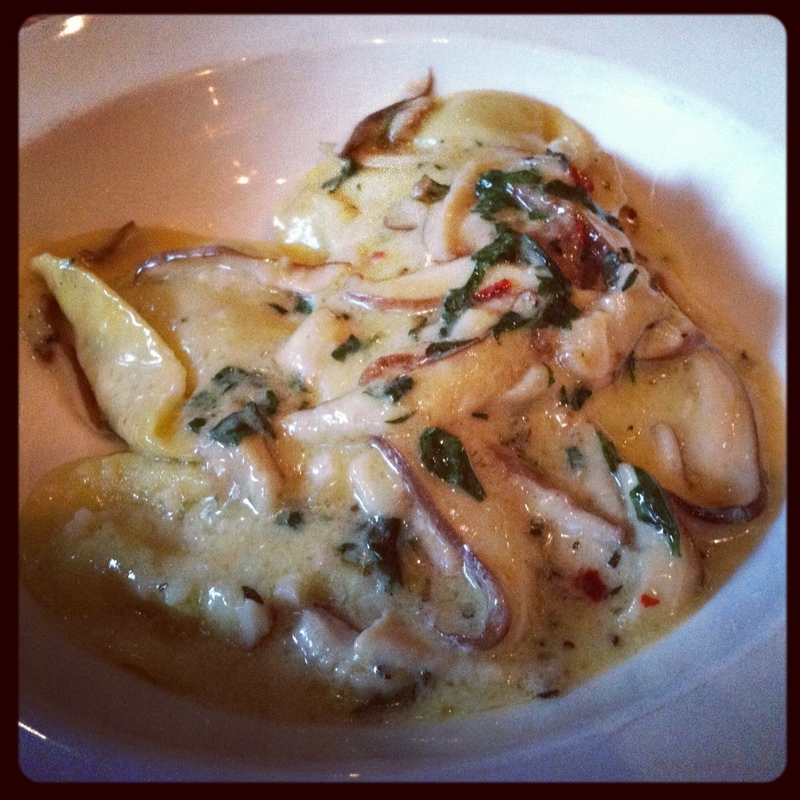 Service: Gina was trying to decide between the Tagliatelle with Summer Corn, Mushrooms and Pancetta, and the Raviolis. She ordered the tagliatelle but the server also brought out a small portion of the Mushroom Filled Lune pasta dish for us to try! I’m generally not a mushroom fan but I can’t deny that some varieties have an amazing flavor. If you happen to like mushrooms you’d love this pasta dish. Besides that lovely surprise, our server was really great. As we were 1st time diners he described the entire menu to us, explaining certain dishes and the names/types of the pasta offered. The manager checked in on us as well which you don’t always see. Overall: So I’ve completed the Michael Schlow list and I can honestly now say that my overall favorite is Alta Strada! While Happy’s may be considered the most casual of the 5 restaurants, Alta Strada is the most comfortable, consistent, and the menu is right up my ally. The food is top notch with perfect portions, and the atmosphere is sophisticated casual and modern with an open dining room complete with brick walls, earth tones with pops of red and lime green, and chalk boards hung above a long bar. The typically 20 minute ride from Boston took me an hour with rush hour traffic but it was totally worth the drive. And if you live/work in the area think about visiting the Alta Strada Market on the basement level which sells lunch items and to-go containers of almost everything they have on the menu! 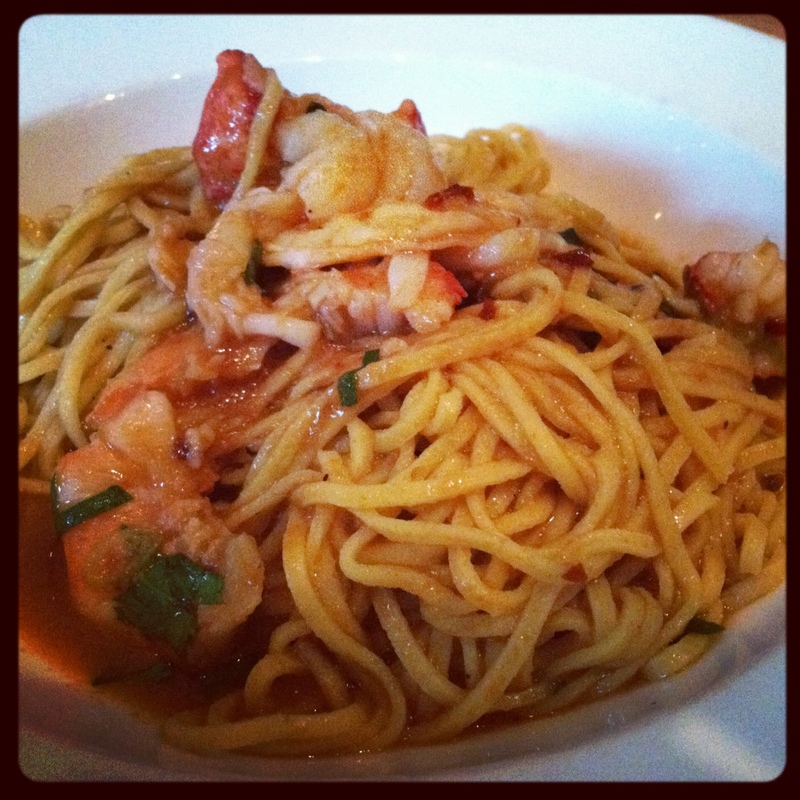 The Perfect Bite: Chitarra pasta with a forkful of lobster meat.